PRX815W is a portable and small-blueprint speaker in the PRX800 Series. Utilising a 15" 275G Differential Drive woofer to virtually eliminate distortion distortion as well as reaching higher SPL, alongside a 1.5" annular polymer diaphragm, the PRX815W has been built to deliver maximum performance for its weight and size. The PRX815W is the latest model of the highly successful PRX Series. It utilises JBL’s road tested transducer technology with edgewound ribbon voice coil to improve efficiency and power handling. 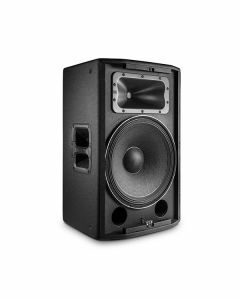 The PRX815W is powered by a 1500 watt high performance, low distortion biamplification system designed to dispense sparkling power with optimum headroom to deliver smooth, high frequencies and rich, deep bass response even at very high sound power levels. Deploying the most up-to-date manufacturing materials and methods, JBL has calibrated the PRX815W’s enclosure for optimum acoustic resonance. The end result is tremendous volume and outstanding performance in a convenient, lightweight package. Indexed feet moulded into the PRX815W enable convenient storage and transport, on top of protected stacking for stage monitor and traditional stand-up configurations. Additionally, the intuitive location of the handles on the PRX815W guarantee you'll have no trouble carrying it around, while integrated hardware mounts make it possible to fly with the PRX815W if necessary. An examination of the PRX815W radiation characteristics at different points on the high and low-frequency drivers enabled JBL engineers to discover a ground-breaking approach to waveguide design. The PRX815W utilises standalone waveguides for each component that controls the sound radiation at the high frequencies, the crossover point, and at the low frequencies, ensuring unparalleled sound quality. Innovative design also provides consistent frequency response across the PRX815W’s entire coverage area, sending smooth, transparent sound to everyone in your audience.